Word of God made flesh. Posted on January 19, 2013, in Carpe Diem, Dublin, Haiku My Heart, Ireland, Recuerda Mi Corazon, senryu, Shadow Shot Sunday 2. Bookmark the permalink. 28 Comments. Lindo demais, da perspectiva à luz, perfeito! Bela partilha, um abraço! Enchanting sense of the sacred in the beautiful arches! Gorgeous design! Love this photo! I love old churches. We recently started attending a small old church: cathedral ceiling, stained glass, intricate wood carvings…the whole deal. So much prettier than the modern ugly ones churches build now. And Your words are just as beautiful, as usual. This is an amazing shot .. beautiful church! Wood with light and shadow is something very special .. I can’t quite pin point what the feeling is when I see it but it is a warmth .. great SSS shot! Stunning church interior-it can be anywhere in the world, can’t it (and it is!). There is something incredibly grounding and comforting about knowing that. 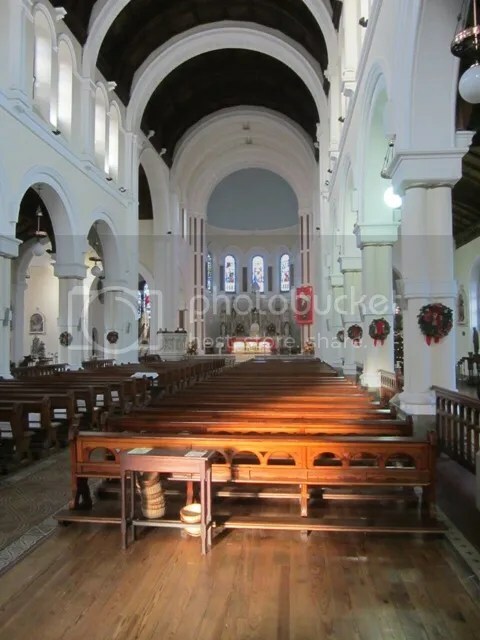 Wonderful shot of interiors of church. Wooden kneelers and collection plates — looks like a catholic church to me! But hearing the old love story is worth the price of admission. This sanctuary looks similar to a church in our community that was built by Irish immigrants. The pews are very different, though. A fresh perspective. Well done! What a beautiful and unusual church. The wooden benches are so lovely, with their patina and craftsmanship. And I’ve never seen a ceiling in a sanctuary painted black. … broken heart or not? Love is always my heart is. THAT just lifts my spirits. What an awesome haiku … and that picture … really nice … The Gathering of the Believers. What a beautiful photo and Haiku. Churches are such beautiful buildings, with their amazing architecture and details. Not to mention the warm inviting feeling you get when you step inside. A love I guess I will never share. But it’s still beautifully expressed, and old churches can be breathtakingly beautiful. one cannot hear a love story too many times. your image brings to mind the many forms of worship and love i’ve visited in the world. thank you for sharing the beauty today. What an awesome church sight to behold. impressive home for our God! I love the pureness of white. the ultimate love story Amen!!! …the greatest of these is love…such a lovely photo mmt!!! i love the way the light filters in to hear the ancient love story! A love story I don’t know, but well written haiku and beautiful picture..